Discussion in 'Articles' started by Dæmon, Apr 16, 2018. 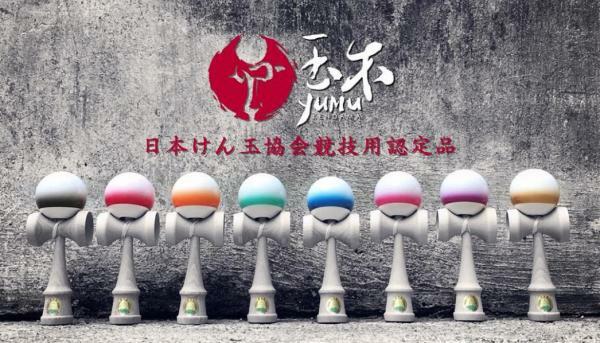 The latest JKA Certified Kendama is available, and this time it's from Yumu Kendama. The kendama is reported to have that classic shape from other JKAs, with the durable, grippy paint that makes Yumus so fun to jam. They will be available in In 8 different colorways, with excellent tracking to help you reach the next Dan level. Yumu was founded by Kendama enthusiast Parker Yu. Yu admired the JKA methods on Kendama education, and attempted to use their methods to build the kendama scene in Taiwan. He created the Taiwan Kendama Association in 2008 and his goal is grow kendama into a visible public sport. Yu's initial factory was influential in early sweets and Kenco productions. These JKA damas are available on kendamalife.com and Amazon. If you have any questions, or need help with US shipping, contact fellow Downspiker Vincent Dimaya who is a Yumu USA Team Manager. KirStylez, Kiyoshikame, Wendy Nugroho and 1 other person like this. Someone xpost a pic to the JKA thread! Vincent Dimaya and ChrisPChicken like this. It will be a classic red and yellow for me ! Thanks for posting this . I'm in like flynn !! Wait..are these like comp certified and have sticky paint? Can anyone tell me what wood these Kendamas are made of? The JKA certified Ozora Premium line also has "sticky" paint though it's JKA sticky meaning it's not going to be as gooey as the current crop of sticky clears out there. @goenKendama @J-Swish these are sticky enough that I am shockef that the JKA OKed it. As it is, i was even more shocked the JKA OKed tracking for the Ozoras. I don’t know who it is that might have replaced the old president, but regardless, they have my thanks for slowly looking to move with the times. Interestingly enough the top brass at the JKA hasn't suddenly been replaced with seed pod grown clones but change does come, albeit slowly, even to the JKA. Who knows, there might be even more news from the land of the rising sun in the not too distant future. Also I believe there were some older Shinfuji or other JKA certified kendama that had equator bands painted on them. I was told that some makers just have trouble with them. It might have to do with the durability of the paint that the JKA requires since bands tend to be one of the last layers and might not be as durable as the base paints.